Congratulations to all of our winners! So well deserved! Incoming eighth-graders from nine of the 11 Wayne County school districts recently received hands-on experience in different industries at the Wayne County Career Carnival at the Wayne County fairgrounds in Palmyra. Students visited 35 vendor stations from six career categories and were exposed to hands-on experiences like building a radio, seeing a 3-D printer in action, taking apart a kitchen stove, checking radiation levels in the environment, working with a pump, sitting inside a police car, seeing wild and farm animals up close, decorating cookies, touching animal pelts, learning where U.S. citizens go to serve in the Peace Corps, working on a health care dummy and seeing how high-precision commercial lenses are made. Area businesses and nonprofits were divided into six career clusters, including arts and humanities, business and information systems, engineering and technology, natural and agricultural sciences, health services and human and public services. More than 150 students rotated through the different clusters over a three-hour period to get basic information and an understanding about different career opportunities in Wayne County and the region. The students were treated to pizza from Mark’s Pizzeria and other delicacies after visiting the booths. They then participated in fun zone activities by playing games, taking part in competitions and eating cotton candy until the event ended. The idea for the event started at a luncheon meeting at Parker’s Grille in Newark in October 2015. Assemblyman Bob Oaks, R-130th Dist., met with Jay Roscup from the Lyons Central School District. Oaks has been interested in career readiness and encouraging school programs to give students as much exposure to career options and a greater sense of the importance of taking full advantage of their school experience. Roscup came out of the meeting determined to find a way to make a career day happen. Roscup is an active member of the Wayne County Partnership for Strengthening Families. This group convenes five times a year with work groups to discuss ways to help families deal with day-to-day challenges and suggest ways to help families function better. He pitched the idea to WCPSF’s Education Work Group and gained their support. It was not long until he had the area Boy Scout Explorers involved and he recruited Don DiCrasto from Scarlet Thread Ministries to be the operations manager. Numerous meetings were held with dedicated volunteers to imagine, design and plan the event. Several companies responded to the request to provide a hands-on experience to eager eighth-graders. School districts made the commitment to provide transportation to the fairgrounds and provide chaperones, and the Wayne County Fair was excited to support the event and waited to take down some of their booths after the fair ended so the facilities could be adapted for the Career Carnival. “It all came together for a very positive day for the students and the adults involved,” DiCrasto said. Event sponsors included Exelon Corp. and the Ginna Nuclear Power Plant, Dr. Pepper/Snapple Group, Mark’s Pizzeria, Wayne County Fair and Seneca Waterways Council Boy Scouts of America. Steve LeRoy, chairman of the Wayne County Board of Supervisors, toured all the vendor areas and came away impressed. The school districts that helped make the event a success included Clyde-Savannah, Lyons, Newark, North Rose-Wolcott, Palmyra-Macedon, Red Creek, Sodus, Wayne and Williamson. Participating area vendors included Optimax Systems Inc., Integrity Tool Inc., Garlock Sealing Technologies, OptiPro Systems, G.W. Lisk, Finger Lakes Community College Mechanical Technology Program, Exelon-Ginna Nuclear Power Plant, Advanced Atomization Technology, Ruffalo Enterprises, Lagana Heating and Plumbing, Boys Scouts of America, Data Conversion Sciences of New York Inc., Reliant Community Credit Union, New Horizons at Logical Operations, Montezuma Audubon Center, Humane Society of Wayne County, Cracker Box Palace, Genesee Land Trust, The Dolomite Group, LART, Upstate Collective, Premier Martial Arts, Lea's Farrier Service, Krittrkris and Feathered Friends Wildlife Rehab, Rochester Regional Health, Newark Wayne Community Hospital, Wayne County Public Health, Wayne County Sheriff's Office, Wayne Arc, New York State Department of Environmental Conservation Police, Drug Enforcement Administration, Peace Corps, Wegmans Food Markets, Newark Public Library, PhotoChica Photography, Sugary Delights Gourmet Cotton Candy, Perfectly Posh and Chair and Pink Zebra. Peter Ostrum, who was cast as Charlie Bucket in the 1971 Movie Willie Wonka and the Chocolate Factory, which starred Gene Wilder and Jack Albertson, was at the Gould Hotel in Seneca Falls on Thursday night for a press conference and party to promote the Seneca Community Player’s production of the musical version of the show this summer. Ostrum was suggested for the part of Charlie while he was acting with the Cleveland Repertory Company in his home city at the age of 12. Ostrum is now a large animal veterinarian in Lowville, NY after he decided that as wonderful as his experience was, acting was not what he wanted for a career. He went to Ohio State University and later graduated from the Cornell University College of Veterinary Medicine. At the reception at the Gould, he met with five students who had one Golden Tickets in a school sponsored contest. The youngsters had an opportunity to meet privately with Ostrum, who told them about his experience. Each winner also got to ask a question of the child actor and he signed photo for each one. Sponsors of the event brought an array of chocolates and candies for the 135 attendees. Food vendors included Downtown Deli, Cafe XIX, the Gould, Connie’s Diner, Parkers and Sugary Delights, a cotton candy maker from Penfield. Other sponsors included Sinicropi Florist, Doran Funeral Home, Abigails, Love’s Italian Ice & Custard, Seneca Daily News and Woman Made Products. CANANDAIGUA — Why is two-and-a-half-year-old Kya Bach her daddy’s hero? It’s because of that smile and twinkle in her eye — no matter what.The pint-sized Canandaigua resident is a splash of sunshine, despite the rare spinal cord tumor — a glionewronal ganglioglion tumor — she’s endured for most of her two-and-a-half years.Her display of energy around the house defies the weeks of chemotherapy and multiple surgeries she’s had to endure. Now in mid-January, after ongoing treatments, Kya's scheduled for her fourth major surgery to relieve symptoms from a cyst that has grown on top of the tumor in her spinal cord, said her father, Jeremy Bach. And when her chemotherapy wraps up, there’s no guarantee her tumor won’t require further treatments. But despite the stress of back-and-forth trips from Canandaigua to Strong Memorial Hospital for chemotherapy, and having a nurse draw blood, change dressings and do vitals once a week at home, Kya continues to be amazingly cheerful.“She’s my hero, my 'little fighter,' because of what she had to go through — and she has never had it affect her,” said Bach. “Her spirit — who she is — has never faltered no matter how sick she’s gotten.”On one emergency room visit Kya had a reaction to a blood transfusion, and her fever jumped to 107 degrees. “It was pretty scary,” said Bach. “But through it all she was a trooper. She gave back a smile, and was her bubbly self even though she was feeling so terrible.” While chemotherapy is fighting the tumor, it’s also severely compromising Kya’s immune system. Translation: Every sneeze or sniffle that Kya comes across could escalate into the next emergency room visit or hospital stay. When her white blood cell count drops, she and her family must quarantine themselves for a week from going to places where crowds can be expected, including supermarkets or schools. “It could happen at any moment — whether it’s a reaction to something or a common cold that flares into pneumonia — it’s tough,” said Bach. “We’re always taught to protect our children and keep them from all the harms of life, and when you can’t do that, it’s a different ballgame altogether.” Bach has journaled Kya’s journey in a 94-page book he recently release: “Kya, A Daddy’s Diary.” It’s the story of a fatherattempting to deal with traditional masculine roles while going through the hardest thing he’s ever experienced.“When I have a bad day, it’s nothing like her bad day,” said Bach. “She’s inspired me to be a better person, to appreciate life, and to not sweat the small stuff.”A benefit is planned to help Kya and her parents, Jeremy and Jenny, chip away at the mounting medical costs this type of illness can incur. The event, set for Sunday, Jan. 24, from 1 to 7 p.m. at the Canandaigua Moose Lodge on Ontario Street Extension, will also show support for Kya’s 5-year-old brother, Colton —another neighborhood hero and little fighter on behalf of his sister.“I’ve come to realize that cancer doesn’t just affect the patient, it affects everybody,” said Bach. “Sometimes what gets lost in the shuffle is the siblings — but they’re just as much affected, and maybe even more. Pediatric cancer is a whole different ballgame.” Colton has seen his sister going through some scary stuff — in the hospital, just out of surgery — and there have been times when his mommy and daddy have not been there because they’ve been taking care of Kya.“At the end of the day he’s her protector, making sure he’s OK,” said Bach. The fundraiser will feature music by John Carter from 3 to 7 p.m., Sugary Delights Gourmet Cotton Candy from 1 to 3 p.m., games, raffles, a 50/50 drawing and silent auction items. Thanks for Supporting #MKAOK Day: Tinkerbell's Toy Drive! After months of planning, we celebrated Macaroni Kid Act of Kindness Day on Saturday, September 19th! We collected 60 toys from generous members of our community, many of whom celebrated kindness with us at Total Sports Experience in East Rochester! Favorite characters like Tinkerbell and Rosebud (from Enchanted Princess Parties of Rochester), Spikes (Rochester Red Wings), and Chuck E. Cheese joined 16 local vendors and Macaroni Kid to dance along with the tunes of Mr. Loops and complete fun pirate-themed activities. We had over 50 raffle prizes given to participants in the day's festivities, and all children in attendance received a goody bag. The Original Mac & Cheez food truck was on hand for lunch, and Sugary Delights provided gourmet cotton candy for dessert! Families enjoyed reading "Have You Filled a Bucket Today" and they helped fill our giant bucket with acts of kindness! BIG Thank You's to all the sponsors, vendors, goody bag & raffle contributors, entertainment, and (of course) Macaroni Kid Readers(!) who made Macaroni Kid Act of Kindness Day a HUGE success! Because of all of YOU, 60 toys are being donated to The Pirate Toy Fund, where they will be distributed to local children in need. OSWEGO, NY – Food, one of the many reasons people crowd Breitbeck Park in Oswego each summer for Harborfest. The usual selections like gyros, wine slushies and fried dough bring people back to the food and newer selections add a fun flare each year. Featuring the main concert stage, beer tent and a big selection of vendors, Breitbeck was the definitive stop for Harborfest-goers looking to relax, enjoy a meal and great music. There’s a little bit of something for everyone each year. Some of the staples at Harborfest include Garafolo’s, The Spud Shack, Nancy’s Fried Dough, Ashley Lynn Winery, Ma and Pa’s Kettle Corn and Ye-Ero. I get a gyro and a wine slushy every year!” said annual Harborfest attendee Danielle Fellows. Newer to the Harborfest scene were trucks for Heid’s Of Liverpool, Ben and Jerry’s and Macarollin’. 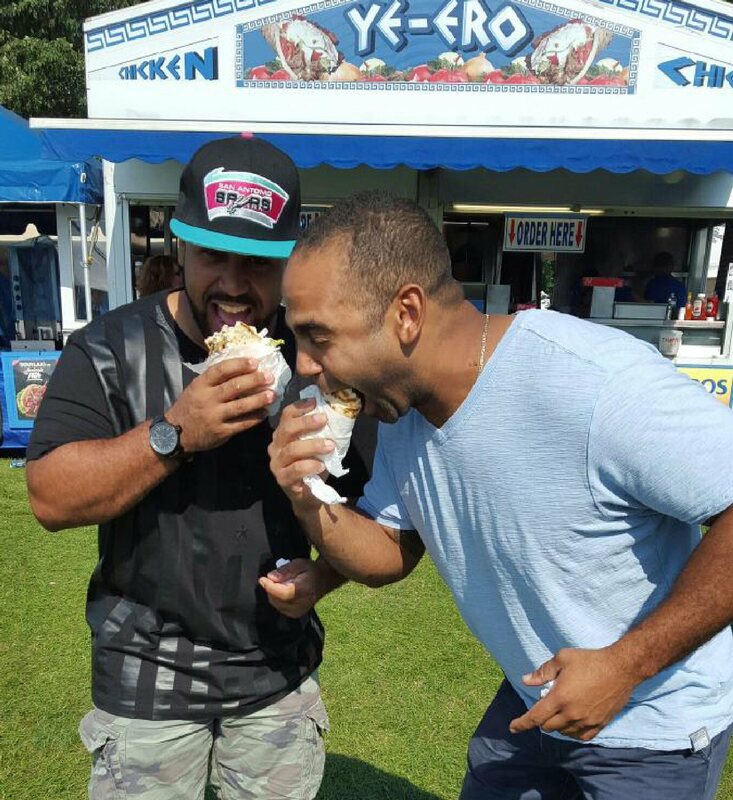 Mario, left, and Marcus Allison dive into their gyros at Harborfest. Macarollin’ is a food truck that serves gourmet macaroni and cheese in a variety of styles including bacon mac, lobster mac, Philly cheese steak mac, caprese mac and of course classic mac. “We have two locations, one at Eastview Mall and one at Marketplace Mall in their food courts and we also have two food trucks. This is our second year at Harborfest, we were successful last year and we are doing great this year already as well,” said Caley Andrews, whose father owns Macarollin’. Aside from Breitbeck, there was carnival food available at Wright’s Landing including corn dogs, chicken on a stick, and sausage. They also provide the usual funnel cakes, but incorporated deep fried Oreos, Twinkies, Reeses, and Snickers. Children were pleased with the selection of staples, cotton candy, fried dough and ice cream. With multiple ice cream vendors throughout Harborfest, a cold cone was always available for those hot Harborfest days. Sugary Delights provided 25 delicious flavors of cotton candy including blue raspberry, grape, and bubble gum and some more unique such as mom’s apple pie, carrot cake and chocolate. "When cotton candy connoisseur Lemar Blue, of Penfield, was making his choice for his festival debut as a vendor, he heard that Fairport CanalDays was the place to be. He usually brings his cotton candy maker and gourmet sugar flavors like mango, cookie dough and raspberry truffle to birthday parties or fundraisers, but he figured after a year of business, it was time to go big. "Fairport's a great little area, and I wanted to contribute something different, something new to this festival," Blue said. "Usually I'm a spectator, but it's great to be here interacting with all the different people, and answering kids' questions about the cotton candy." AutismUp will host its 2nd annual KiteFlite Parade, Festival and Expo on Saturday, August 9 (rain or shine) at Rothfuss Park, 1648 Five Mile Line Road, Penfield. KiteFlite is a family fundraising festival with proceeds supporting the expansion of AutismUp’s unique education programs that help today, develop support for tomorrow, and drive awareness of the future needs of the local autism community. Today, between 1 in 68 children are diagnosed with autism. The event is open to the community and admission is free. Official festivities kick off with an opening ceremony and kite parade at 11:00 a.m. around Rothfuss Park and the festival and expo follow until 2:00 p.m.
KiteFlite will feature kite flying, inflatables, carnival games and prizes, kite crafts, face painting, dunk tank, bubble party music, The Wegmans Zoo Mobile, and Monroe County Sheriff’s Operation SAFE Child. There will be appearances by the Rochester Lancers, Sponge Bob, Penfield Fire Department, Monroe County Sheriff Mounted Patrol Unit, First Student’s Magic Talking School Bus and more. Food concessions will be available for purchase by Salvatore’s Old Fashioned Pizzeria, Pasta Chef To Go, Sugary Delights Gourmet Cotton Candy, Coldstone Creamery of Webster and Starbucks of Penfield. KiteFlite will also include a Resource Expo, where professionals will be able to share their knowledge, products and services with families and the public. AutismUp (formerly known as UNYFEAT) is a wonderful organization I have had the pleasure of writing about many times and have personally seen help and enrich several of my friends families. It is the leading 501(c) 3 autism organization in Rochester and the surrounding areas. Founded in 2004, by a small group of parents of children with Autism Spectrum Disorder (ASD), it has grown to 1,400 members whose mission is to support individuals, and their families, by expanding and enhancing opportunities to improve quality of life. All money raised remains local to support custom programs and services.